A romantic drama about single parenting and second chances, A Cool, Dry Place is earnest enough but also remarkably unoriginal. Russell (Vince Vaughn) is raising his young son Calvin alone; they were both abandoned by Russell's wife Kate (Monica Potter) 18 months prior. The increased solo parenting duties caused Russell to lose his job as a high-powered Chicago lawyer, and he has now moved to a small law office in rural Kansas seeking a quiet and more balanced life. Calvin is often a handful, and Russell also has a challenge coaching the local high school basketball team. He meets Beth (Joey Lauren Adams), the older sister and guardian of star basketball player Noah (Devon Sawa). Russell and Beth start a relationship, but Kate's sudden reappearance again changes everything. Directed by John N. Smith, A Cool, Dry Place almost qualifies as a remake of Kramer vs. Kramer. A man struggles with the added weight of full parenting responsibilities while dealing with abandonment issues. Just when things begin to settle down and look up, he is whiplashed again by his wife's reappearance, as inexplicable as her initial disappearance. A Cool, Dry Place stays away from the final court battle, and otherwise marks its territory with a more rustic, small-town ambiance. Perhaps recognizing that the originality quotient of his material is limited, Smith wisely zooms in on Russell and keeps the film intimate. The scenes of a father's small triumphs and small failures grappling with a child's unpredictable demands and moods give the film an appealing sensibility, and reveal the frustrations of a man whose life has taken a sudden turn around a blind corner. Nothing is as it was, but the new road nevertheless offers intriguing growth possibilities. The women in Russell's life are less well defined, but in the context of the story this limitation works to the film's advantage. Beth represents what the new more pastoral future may offer but only as seen through the fatigue of surrendering the past. Kate's return gradually reawakens Russell's hope that maybe the past can be rebooted. Neither offers a clear-cut option, allowing Russell's dilemma to marinate. 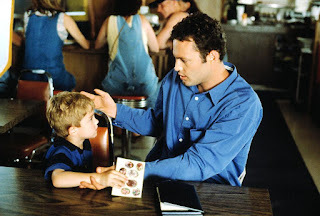 Vince Vaughn demonstrates that he can do plenty with a decent dramatic role, giving Russell soulful warmth and internal anguish disguised for the benefit of young Calvin. Unpretentious and straightforward, A Cool, Dry Place may lack creativity but is a safe location for an affectionate drama.